I've always been a huge New Look fan. I used to spend hours in my tiny local branch on a Saturday trying all the 915 range on, saving up my pocket money to get a new t-shirt or a dress for the school disco. New Look also provided me with great dresses on a budget for nights out in uni and I now get all my wide fit shoes for work from there. I really have grown up with New Look and have always found that they make clothes that are a wearable interpretation of catwalk trends. 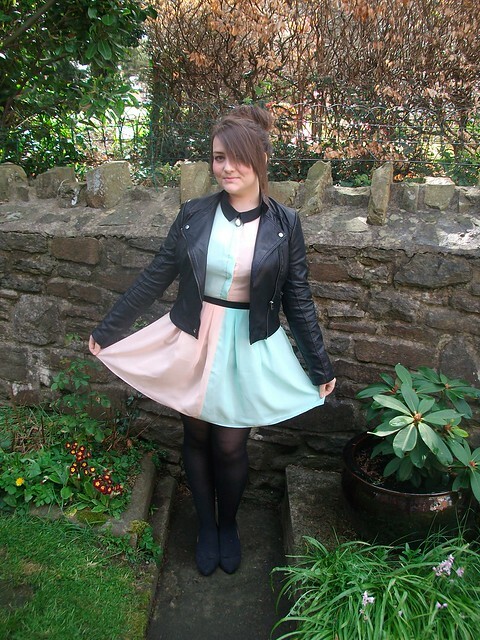 I was allowed to pick any dress from New Look to review and it took me a few weeks to decide, I'm so indecisive! I know I wont stop going on about her but I'm pretty obsessed with Marina and the Diamonds at the moment. I wanted a dress to wear when I see her in May so I eventually went with this Limited Edition Two Tone dress as I think it's very Electra Heart. I used the click and collect service which meant I ordered online and collected the item in store and avoided the delivery charge, great idea! 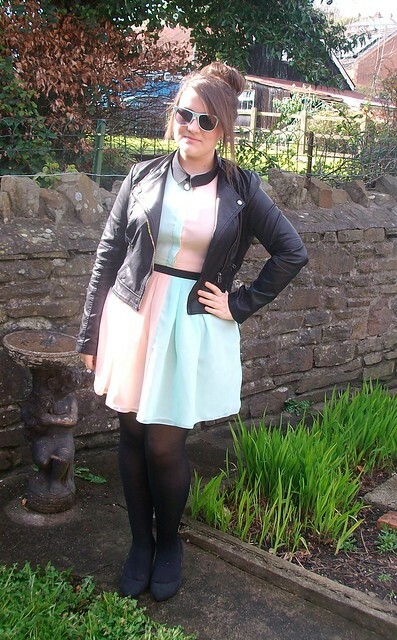 I was going to wear the dress with flats and a cardigan but it is rather special so I paired it with some low heels, biker jacket to toughen it up and some pastel blue shades to compliments the other soft colours. I even put my hair up in a bun and I never wear my hair up. The dress looked lovely with a few buttons undone but I decided to wear it buttoned all the way up with a necklace that my nan gave me as a present. I kept the accessories simple to go with the simple dress, doesn't need to much added to it because it is such a statement dress. I love this dress, the material is lovely and it feels very special on. It does gape around the underarms slightly and is tight on the waist so you might want to size up but I am very pleased with my pick. This dress retails for £34.99 which I think is very reasonable, I'm sure Topshop would price something similar for about £60. How would you style this dress? Are you a fan of New Look dresses? DAMN GIRL! You look absolutely smoking - no word of a lie. Aaaw thanks Rai, took me ages but got the right one in the end. 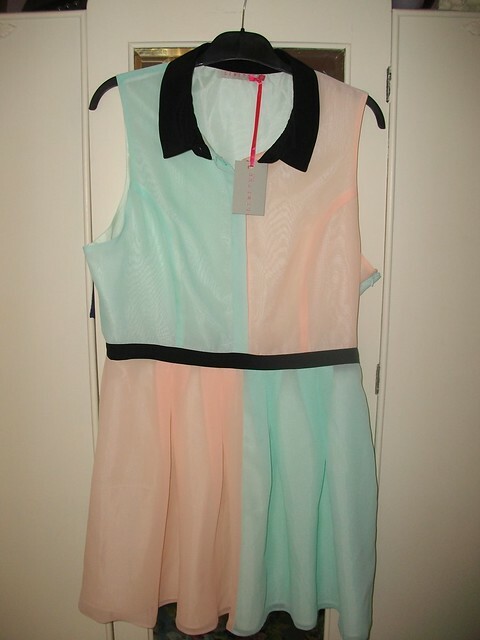 The dress looks gorgeous, I love the colours and the necklace is perfect with it! I really love that dress! The way you styled it gives it this retro kind of look. 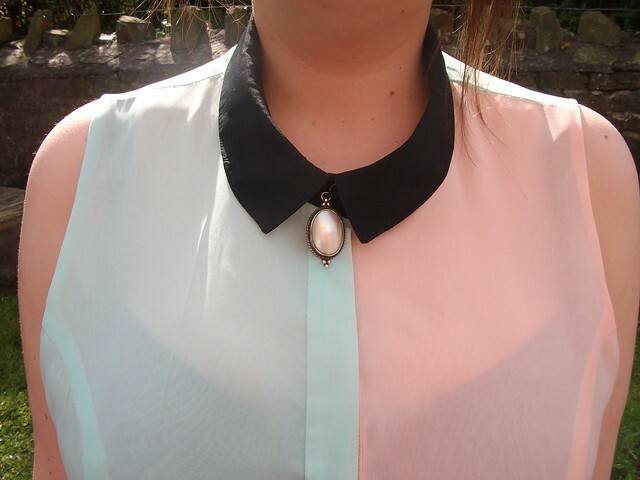 The necklace you paired with the shirt is so cute! Great outfit! Ha I remember going mental in the little 915 section of my local Newlook trying on all the cropped tops with the polo collars! Love this dress, and you look smashing with your hair up! love the dress and the way you styled it. very cute! That dress is cute! I would probably go the whole hog with the biker look and rock a pair of boots with it. Gem you look stunning, your hair looks amazing like this! Def should wear it up more often. Not too happy with you though as I now feel the sudden urge to own this dress, my bank account no likey! You look stunning, love how you have made the dress really wearable for most occasions!! Oh wow you look fab! This looks amazing on you! Love how you've styled it too. I've been umming and aahing over buying this and think I might have to now! That looks fantastic on you, great choice. I love New Look dresses, it's one of the places I go to first for dresses. So stylish and sassy. Gorgeous! You look AMAZING, love love love this look on you! you look so cool in this dress! It's one of those items that I doubt would be me but the way you've styled it, is great!